This is an adrenaline fueled activity which is guaranteed to excite and leave you with a big grin on your face! 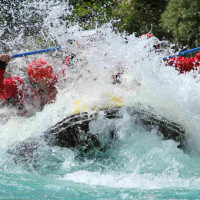 Never mind the rain - in fact the more the better as that's exactly what we need for the ultimate white water conditions. White water Rafting is an adrenaline fueled activity which is guaranteed to excite and leave you with a big grin on your face! When most people are heading indoors to sit beside the fire, we're doing the opposite - heading out into the often miserable abyss for an exhilarating white water experience! It might be raining and a bit chilly, but that's what we need for the ultimate white water conditions - plenty of rain, the river lapping the top of the river bank and a few adventurers!